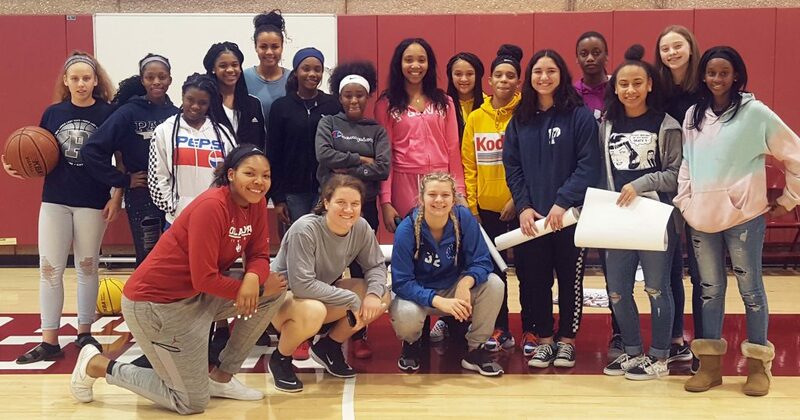 For the second year in a row, the University of Oklahoma Women’s Basketball Program donated tickets to Paris Junior High School’s girl’s basketball Coach Hiyadeja Moore and she took the eighth-grade team on a field trip. The invitation was also extended to the freshman team and Paris High School’s Hope Beck and Jada Woodberry traveled with the eight graders to Norman, OK, and watched OU play nationally ranked Baylor University. Front row (from left:): OU Women’s Basketball players Aspen Williston, Madi Williams, and Tatum Veitenheimer. Back row: Hope Beck, Jada Woodberry, Za’Tyrani Washington, Asia Johnson, Keiariah Savage, Kalia Patterson, Zakiya Gray, Keyli Holt, Jazzlynn Dangerfield, Angelina Ibarra, Keshanti Gordon, Kiley Martinez, Maci Meyer, Patricia Garnes, and OU Women’s player Ana Llanusa.